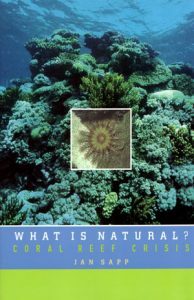 What is natural? Coral reef crisis. During the late 1960s and 1970s, massive herds of poisonous crown-of-thorns starfish suddenly began to infest coral reef communities around the world, leaving in their wake devastation comparable to a burnt-out rainforest. In What is Natural?, Jan Sapp both examines this ecological catastrophe and captures the intense debate among scientists about what caused the crisis, and how it should be handled. The crown-of-thorns story takes readers on tropical expeditions around the world, and into both marine laboratories and government committees, where scientists rigorously search for answers to the many profound questions surrounding this event. Were these fierce starfish outbreaks the kind of manmade disaster heralded by such environmentalists as Rachel Carson in Silent Spring?, Indeed, discussions of the cause of the starfish plagues have involved virtually every environmental issue of our timeover-fishing, pesticide use, atomic testing, rain forest depletion, and over-populationbut many marine biologists maintain that the epidemic is a natural feature of coral-reef life, an ecological “balance of nature” that should not to be tampered with until we know the scientific truth of the crisis. But should we search for the scientific truth before taking action? And what if an environmental emergency cannot wait for a rigorous scientific search for “the truth?” The starfish plagues are arguably one of most mysterious ecological phenomena of this century. Through the window of this singlular event, What is Natural lucidly illustrates the complexity of environmental issues while probing the most fundamental questions about the relationship between man and nature.